Futuristic racing is born with the Drone Racing League! Each quadcopter drone is remote controlled by its racer with the aid of First Person Video, in which footage from cameras mounted to the front of the drone is streamed in real time to a headset worn by the racer controlling the drone. Reaching speeds of up to 85 miles per hour these purpose built drones race through checkpoints and complete a set number of laps to determine the winner. Think of the futuristic racing video game Wipeout, only smaller in scale and very, very real. The Drone Racing League is the birth of a new sport which investors Stephen M. Ross (owner of the American Football team, the Miami Dolphins), Matt Bellamy (Lead singer of British rock band MUSE) and the talent agency CAA are all hoping will become the first new "future-sport" of the 21st Century. 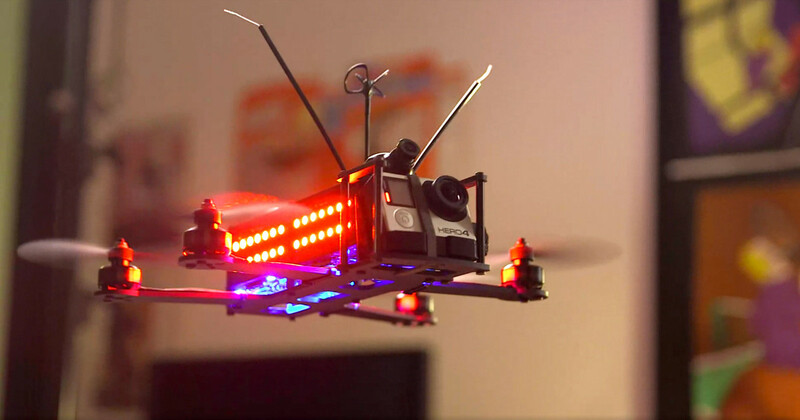 A DRL FPV quadcopter drone, fitted with team color LED's and HD camera! While FPV racing has been around for a while, the formation of the DRL and the high profile investment shows great promise for the fledgling sports future. And with a little personal investment beginning at a mere $150 anyone one of us could become one of its founding star racers. Watch Scified play Overwatch on Twitch this Friday! Overwatch Hero Symmetra to be updated! Gears of War: The Movie as cast by the fans! Scified's Top 5 gaming winter warmers! 0 Fan responses to Futuristic racing is born with the Drone Racing League!